Mushroom are not an everyday item in my kitchen but i'm slowly warming up to it. Here we get many varieties of mushroom in the market and some of them very exotic and expensive . I really want to try all of them :) and started with the most common one . Few days back i cooked button mushrooms like i cook chicken and worked well with chappati . So thought of documenting it . 1. Grind onion ,ginger garlic to smooth paste . 2. Grind tomato to a smooth puree. 3. Heat oil and add bay leaf, cardamom,cinnamon,cloves. 4. Add onion paste and cook till oil separates. 5. Add chili , turmeric,coriander powder,salt and cook for a minute. 6. Add tomato puree and cook till oil separates. 7. Add mushroom and mix well and cover and cook. 8. Mix light handedly now and then and let mushroom cook low and slow. 9. Switch of flame and garnish with coriander leaves. 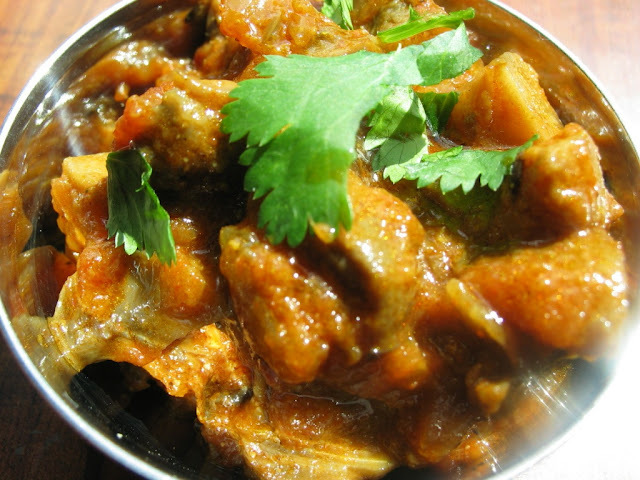 Love this spicy mushroom masala..Nice click! Yummm!!!! Would go really well with chapathi. Have a nice weekend Nisha! I m a big fan of mushrooms...it tastes gr8 with indian spices. Nice recipe, loved the color. Mushroom is my faaav one,,masala mushroom looks soo delicious n yummy dear.